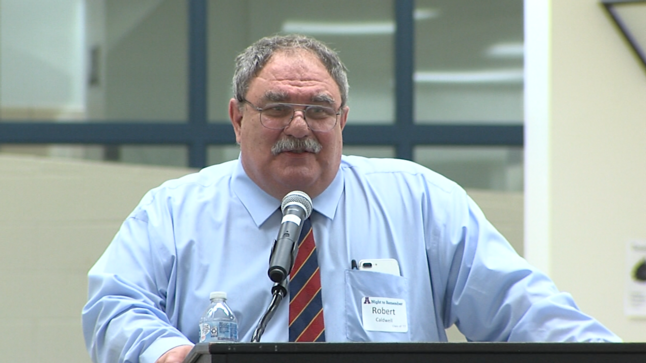 Our guest speaker was retired Navy Captain Robert “Bob” Caldwell, a 1977 graduate of Albemarle High School. Bob is widely believed to be the only Albemarle graduate who spent his senior year in London, England. His Dad was transferred to England at the end of his junior year. Despite wanting to stay and finish his football, track and academic career at Albemarle, Bob had to move to London Central High School for his senior year. According to Wikipedia, graduates of London Central included a couple of astronauts, three generals, a judge, and founders of the band America who brought us hits like Muskrat Love and A Horse With No Name!, but Bob wanted to graduate from Albemarle, and Mr. Hurt took some extraordinary steps to make that happen. After graduation, Bob Joined the US Navy, but eventually returned to Charlottesville and received a Nuclear Engineering degree from UVA. After a distinguished career as a “Navy Nuke”, he is currently the Director of Engineering and Infrastructure, Office of New Reactors at the US Nuclear Regulatory Commission. Dr. Pamela Moran - retiring Superintendent of Albemarle County Public Schools. She was Virginia Superintendent of the Year in 2015. Dr. Moran was instrumental in the formation of the AHS alumni Association and has has been very supportive of the group since it was organized in the fall of 2008. Nicholas "Nick" Novak - Nick is a 2000 Albemarle High School graduate. After his success on the football field at Albemarle High School, Nick attended the University of Maryland where he earned All-ACC honors two years and was awarded the ACC Jim Tatum Award as the top senior student-athlete. In the first game of his senior year, Nick became the all-time Atlantic Coast Conference leading scorer with 393 points and fifth best in the NCAA at the time..
LeRoy Smith - An Albemarle High School teacher and instructor for more than 30 years beginning when the school opened in. He taught many subjects including Industrial Arts, Mechanics, Engineering Drawing, Mechanical Drawing, Metalwork, Woodworking, Modern Industry and others, and was the first soccer coach at Albemarle. He is fondly remembered by thousands of AHS. Mr. Smith passed in 2007.